Villa Magna Residences is a gated community offering 24 hour security. This beautiful development is located on the largest stretch of beach in the bay & consists of 4 towers; towers 1-3 (Villa Magna Condos) & tower 4 (Dreams Resort & Spa). As a condo guest you have access to resort services including: a Spa by Pevonia, gym, wedding planner, business center, internationally themed restaurants, & eclectic bars. (Resort services are charged separately & must be purchased directly from the hotel or spa.) Outside you can relax in the sun alongside one of the 3 large swimming pools featuring a heated adult only pool & shallow kids play area or take a nap under a thatched palapa on the seemingly endless beach. This beautiful paradise is the perfect balance of secluded beach and modern amenities. Walk for miles on the flat endless beach or sit poolside and take in the natural beauty that this condominium has to offer you. Very special one bedroom condo, one bath is located on the 8th floor offering spectacular views of the Bay. The bedroom has a king-size bed and a flat screen TV. The kitchen comes with a granite counter top, is fully stocked with all the cooking utensils, refrigerator with filtered water, stove, oven, microwave, and dishwasher and overlooks the living & dining areas. The living room has a 60” smart flat screen TV (Cable / DVD) & wireless high speed internet (WiFi). The phone has a US number & can make calls to the US & Canada with the Vonage World Plan. The oceanfront balcony has 2 chairs and a table for your comfort while taking in the breathtaking sunsets or scanning the bay for whales and dolphins. Additional features include: washer/dryer in unit, room-by-room controlled air-conditioning, and a private parking space. Our bi-lingual property manager is on hand to welcome and assist you with any questions you might have during your stay. Prior to your visit, we can give you advice on car rentals, boat trips, and local restaurants. The weather from November until June is usually fantastic with sunny days in the mid 80’s and nights in the upper 60s/low 70s. Many people have told us they find the weather to be consistently better in Puerto Vallarta than in Hawaii. The rainy season occurs from August until October with hot, humid weather similar to Houston. November and early December is a great time to see the turtles crawl out of the ocean and lay eggs. The whale season is from December to March, and baby turtles hatch from late February through late March. The First Half of November is the Gourmet Dining Festival where famous chefs are showcased at many gourmet restaurants. The first half of December there are many special Mexican Christmas Festivities. The second half of May is Gourmet Food Festival with many world class restaurants offering special discounted prices. Every year December 1 to 12, stunning displays and floats flood the streets of Puerto Vallarta during the annual Festival of Our Lady of Guadalupe, a frenetic celebration commemorating what many believe was the miraculous apparition of the virgin Mary seen by a local peasant in December 1531.During the festival, vibrant processions come in waves throughout the city and surrounding communities. When they converge at the historic downtown Church of our Lady of Guadalupe, a carnival-like scene ensues, with music, dancing, traditional foods, drinks, crafts and souvenirs. With so much going on, many consider this the very best time of the year to visit the city. There are so many fun things to do around Nuevo Vallarta. Enjoy swimming at the infinity pool, walk for miles on the most beautiful beach at Banderas Bay right outside your condo, go to the mall (about 1 mile) where there are fabulous shops and restaurants, a super market, car and boat rental, water taxi ride to PV, and spa. Go boogie boarding, take a water taxi, whale watching, and so much more! Inquire at Vallarta Adventures (right in Nuevo Vallarta) to find out about special adventures to take while you are in town such as a catamaran voyage to Yelapa and Majahuitas, Wild Dolphins and Snorkeling, Sierra Madre South, Canopy Zip-lining, Sea Lion Encounter, Journey to Las Caletas, Hilltop Spa and a favorite- Rhythms of the Night spiritual journey. 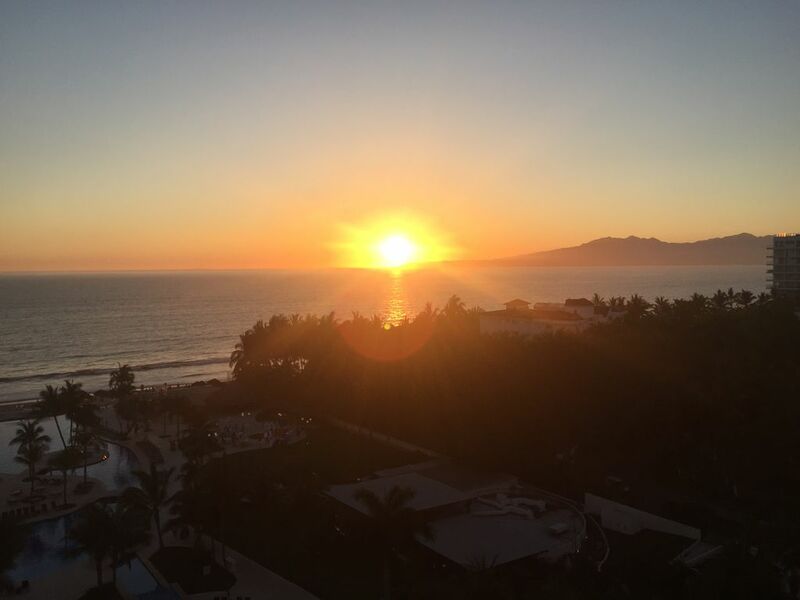 There is also Puerto Vallarta to explore as well as just relaxing on the beach or going golfing at one of the great local golf courses near the Marina. Bus and taxi service available nearby. But there is lots to walk to along the beach including restaurants, turtle preserve with (in season) nightly releases you can participate in, parasailing, jet skiing, massages, and local vendors. Sue and I just bought this condo in March of 2016. We have stayed in many of the condos in Villa Magna over the years and decided it was time for us to have our own. Our family has so many wonderful memories of great times here we could not go anywhere else. We hope you and your family build great memories ones too! Enjoy! We loved this piece of property the moment we walked in. It has a fantastic view of the ocean and the sunsets. We have seen whales, dolphins and interesting boats. But, most of all the sunsets are phenomenal. We really enjoyed our stay in Sue And Greg's condo. We stayed in the all inclusive part of Dreams resort last year. Thought we’d try it this way and we liked it more. Lots of restaurants nearby and you still get to enjoy the beach and pools. You can pay for drinks on the beach or bring you own. We'llbe back. We love everything about Villa Magna and this condo is perfect for us. We are looking forward to our return trip. The condo has everything we need and the owners are very accommodating and pleasant to work with. Just great! Furniture, services, silverware... everything you may need. Owners are great people. Will return. Thank you for choosing our condo for your vacation. We love Villa Magna and enjoyed sharing our condo and the facility with you and others. We would love to have you return. We had a great time at Villa Magna! This was the 10th trip to Nuevo Vallarta but our first VRBO experience. We loved the simplicity of it all and the laid back quiet environment. The view is spectacular, the amenities are exactly what you need (and more). The condo is comfortable and nicely decorated. It makes you feel at home. Snack bar is great! Beach and pool access is excellent! There are many great restaurants nearby and the area is wonderful for taking a run or walk in the mornings. The owners are extremely responsive to any questions we had. We are definitely coming back next year! We enjoyed staying at this condo at Villamagna very much. From the start the owners were very easy to deal with, and kept in touch well when we had questions. When we arrived we were amazed with the views from the balcony of this condo. What an excellent location to watch activities on the ocean, sunsets every night and the "Dreams" all inclusive shows in the evening! The property is gated and the location of this condo is handy to the elevator/parking spot when you arrive with groceries. The pools were large and clean and the beach was great. We would definitely return in the future if it worked out for us. Greg and Sue were extremely helpful and responsive to all of our questions. The condo is very comfortable and has everything that you could want for your stay. We were there for a week. The condo was very quiet, parking was close to the elevator, the view of the sunset every night was spectacular. The Villa Magna property has several pools, is gated, and you can sign up for the all inclusive for 24 hours at the Dreams Hotel on site if you want. We did for one day and found all of the food at the restaurants to be great. A step above most of the other all-inclusives we have stayed at. Would stay again at Sue and Greg's condo if we were heading to PV. Payment in US dollars Confirmation of rental will be sent once we receive deposit. 50% of total is due upon booking. 25% is refunded to you if you cancel within 60 days of first day of stay. Balance is due 30 days prior to first day of stay. There is a $50 cleaning fee and a refundable $250 damage deposit. Your damage deposit will be returned to you within a couple of days once final inspection by our property manager is complete. There are no hidden fees, the price quoted and provided in the confirmation is the total cost.